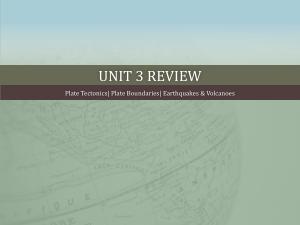 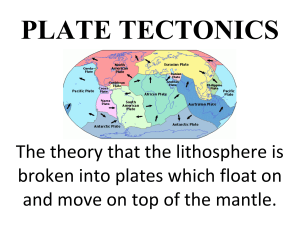 Plate tectonics (from the Late Latin tectonicus, from the Greek: τεκτονικός ""pertaining to building"") is a scientific theory that describes the large-scale motion of Earth's lithosphere. 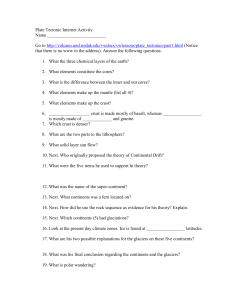 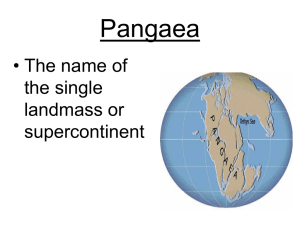 This theoretical model builds on the concept of continental drift which was developed during the first few decades of the 20th century. 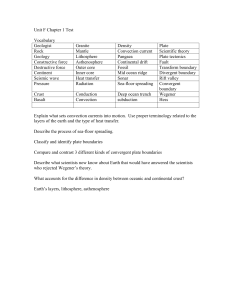 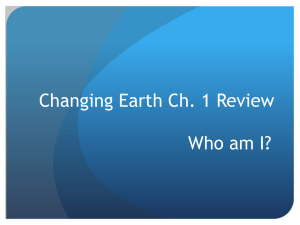 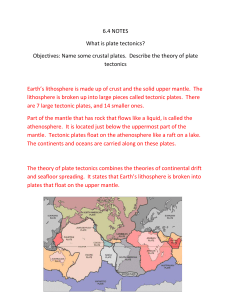 The geoscientific community accepted the theory after the concepts of seafloor spreading were later developed in the late 1950s and early 1960s.The lithosphere, which is the rigid outermost shell of a planet (on Earth, the crust and upper mantle), is broken up into tectonic plates. 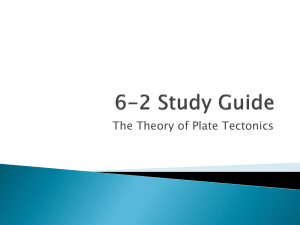 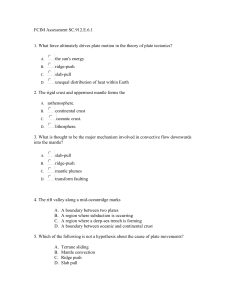 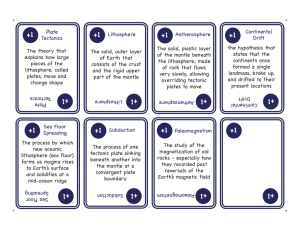 On Earth, there are seven or eight major plates (depending on how they are defined) and many minor plates. 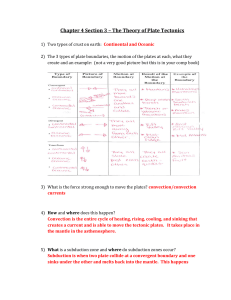 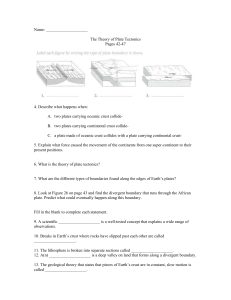 Where plates meet, their relative motion determines the type of boundary; convergent, divergent, or transform. 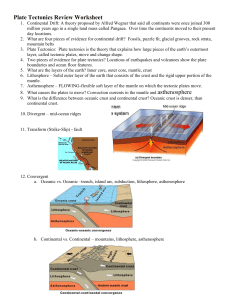 Earthquakes, volcanic activity, mountain-building, and oceanic trench formation occur along these plate boundaries. 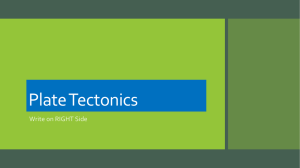 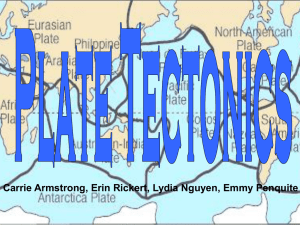 The lateral relative movement of the plates typically varies from zero to 100 mm annually.Tectonic plates are composed of oceanic lithosphere and thicker continental lithosphere, each topped by its own kind of crust. 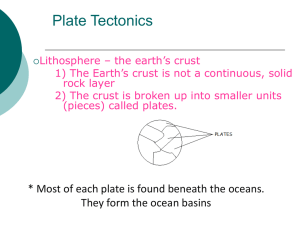 Along convergent boundaries, subduction carries plates into the mantle; the material lost is roughly balanced by the formation of new (oceanic) crust along divergent margins by seafloor spreading. 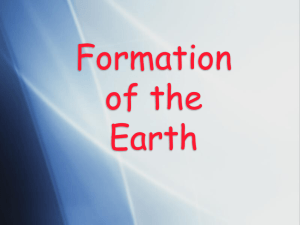 In this way, the total surface of the globe remains the same. 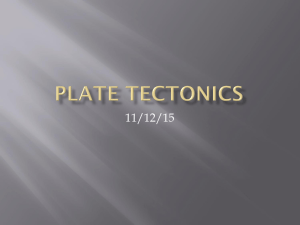 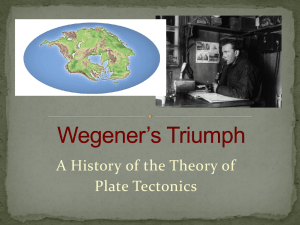 This prediction of plate tectonics is also referred to as the conveyor belt principle. 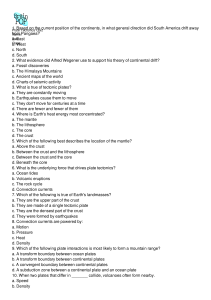 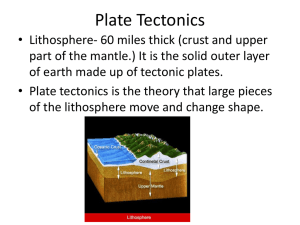 Earlier theories (that still have some supporters) propose gradual shrinking (contraction) or gradual expansion of the globe.Tectonic plates are able to move because the Earth's lithosphere has greater strength than the underlying asthenosphere. 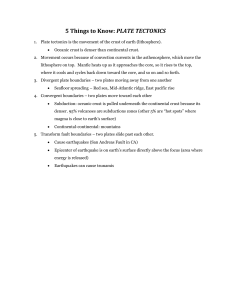 Lateral density variations in the mantle result in convection. 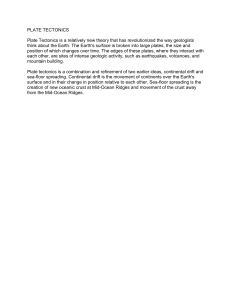 Plate movement is thought to be driven by a combination of the motion of the seafloor away from the spreading ridge (due to variations in topography and density of the crust, which result in differences in gravitational forces) and drag, with downward suction, at the subduction zones. 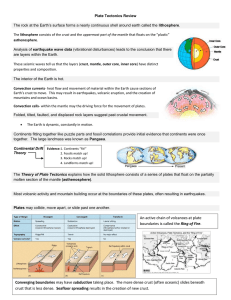 Another explanation lies in the different forces generated by the rotation of the globe and the tidal forces of the Sun and Moon. 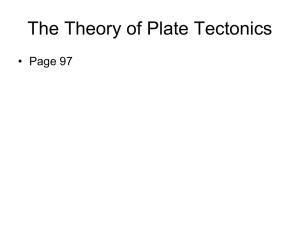 The relative importance of each of these factors and their relationship to each other is unclear, and still the subject of much debate.